There’s a certain kind of writer that brings an inordinate amout of joy to an editor’s life. They’re a rare and beautiful species. I call them “total pros,” and they share four essential characteristics: (1) They do the work, by which I mean they go out and perform the (sometimes tedious, sometimes unpleasant) job of reporting, making the calls and reading the studies and boarding the flights and prepping for the interviews and transcribing the tapes; (2) They are able to take all that reporting, digest it, organize it, and then turn that vast swamp of ideas and information into a neatly-tended, clear and thoughtful draft; (3) They then take the editor’s inevitable, annoying notes on that draft, and perform the brutal task of opening that file up again and diving back into their story, pulling it apart and reworking it, turning it into something that is even better than the original, where every sentence is worried-over and cared-for; and (4) They are nice people. Dan Coyle is a total pro. Five years ago, Dan started visiting “talent hotbeds” all over the world to do research for a book called The Talent Code, which was published in 2009. He visited a tennis academy in Moscow that was turning out a scary number of Top 20 players, a music school in the Adirondacks where kids were absorbing a year’s worth of lessons in two months, an inner-city charter school whose kids were suddenly making a habit of acing the state tests, and so on. 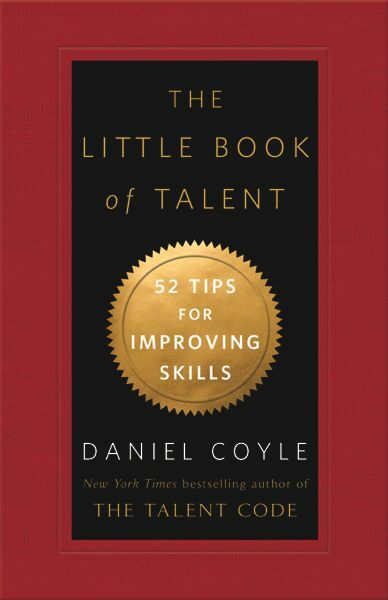 Along the way, and with help from leading neuroscientists and psychologists, Dan produced an inspiring exploration of how talent works, and how it can be nurtured. Now, three years later, he has published an elegant companion guide to that project called The Little Book of Talent. (You know Michael Pollan’s book, Food Rules? Picture that, but instead of telling you how to eat, this is a little workbook that tells you how to get better at stuff.) Inside are 52 simple rules that parents and kids can use to improve their skills in music, sports, art, writing, or school. It’s The Talent Code, distilled. (It has also been sitting on The New York Times bestseller list for the past two weeks, so big ups to Dan, who is undoubtedly spawning a new generation of Yo-Yo Mas and Agassis.) There’s a solid foundation of science and research underlying these rules, but Abby and Phoebe have both read it, and they didn’t have any trouble at all taking it in. We’ve also given it to our kids’ soccer coaches and our music teachers, so beware: you’re up next. Dan was kind enough to take time out of his busy schedule to share a few of those rules with us here. If you have any doubt re. their efficacy, check out this video of Dan putting them into action, which I’ve watched like twenty times. Like I said: a total pro. I am not the first to point this out, but let me say it anyway: when it comes to nurturing our kids’ talents, today’s parents today have it tough. Not because we know too little, but because we know too much. Way, way too much. Nurturing talent used to be a fairly simple process, because it was mostly passive. Parents sat back and waited for the talent to show itself. Now, parental talent-nurturing is an official industry, like organic food. Soccer, violin, chess, math, art — they all provide us with nicely constructed funnels down which we can pour endless amounts of money and time as we try to help our kids become their best selves. Tiger Mothers and Fathers stalk the landscape, carrying their superstar cubs in their mouths. Science has given us terrifyingly concrete concepts, like Critical Learning Periods, where if your kid doesn’t learn something by age X, the door of opportunity slams shut — forever! Being a parent has gone from feeling like a laid-back observer to feeling like a frantic gardener, racing around, trying to find the best way to help talent grow. All of which creates a question: what’s the best way to navigate this new world? I’ve spent the last five years visiting and studying talent hotbeds, and also being the dad of four kids (10-17). So over the last few years my wife Jen and I have done our best to navigate this, and have come up with a simple list of rules that have helped us around your house, a few of which I’d like to share. Don’t: Praise kids for their abilities. Do: Praise kids for their efforts. Why: When you praise kids for their abilities, you diminish their willingness to take risk — after all, we’re status-oriented creatures, and why would anyone who’s been labeled “talented” risk their status? When you praise kids for their efforts, on the other hand, you increase their willingness to take risk, to fail, and thus to learn. One useful phrase to use in praising kids is to say well done. It conveys appreciation, without calling anybody a genius. Don’t: Fall for the Prodigy Myth. Why: Yes, different kids learn at different rates. Yes, some kids take off like rockets; others linger in the belly of the bell curve. The thing to remember: this isn’t a sprint.The majority of prodigies flame out, and the majority of successful people come from the anonymous ranks of average Joes and Josephines. What helps is to understand that the moments of intense struggle are really the moments when learning happens fastest. Those moments aren’t pretty — it’s when a kid is reaching toward something new and missing — but they’re fantastically productive because it’s when the brain is making and honing new connections. Your job is to find ways to celebrate those moments of struggle. Do: Pay attention to what your kid stares at. Why: Let’s do this one in the form of a scene, in which a kid returns from first soccer/piano/karate practice. PARENT: Was it fun? Were you good at it? Do you think you’ll do it next week? The point is, most kids are reliably inept at expressing their inner feelings. So don’t put pressure on them to express them, because it tends to speedily diminish whatever interest they might’ve felt. Instead, pay attention to what they stare at. Staring is the most profound act of communication that kids perform. Staring is like a neon sign saying I LOVE THIS. Watch for the stare, and follow where it leads. One of our daughters got interested in violin because we went to a performance of a teenage bluegrass band. She stared. We didn’t say much. We bought her a violin, and took her to a lesson, and she was into it. That was five years ago; she’s still playing. Why: It’s easy to confuse pleasure and comfort with actual learning. But truly good coaches and teachers are about challenging you to get to the edge of your abilities, time and time again. Seek out coaches who are authoritative. Who know their stuff, and who take charge. A little scary is good. Why: Too many kids (and parents) judge their progress by the scoreboard, instead of by the amount they’ve learned. Victories are their own reward. They do not need any extra emphasis. Celebrating repetition, on the other hand, is not done often enough, because repetition has a bad reputation. We frequently connote it with drudgery. In fact, repetition is awesome. It’s the single most powerful way the brain builds new skill circuits. So make it cool. Doing a hard task ten times in a row is great. Doing it a hundred times in a row is freaking heroic. So treat it that way. Great post. I just forwarded it to my husband. Thanks. I’m forwarding this to a friend. Great post. Off to buy the book! THIS CAME AT THE RIGHT TIME. Thank you, thank you! I needed to see this big time! “Do: Pay attention to what your kid stares at.” – this is genius. Thanks so much for this post! Great post. I will be buying this book! Thank you, so much for this. As a teacher, I almost cried throughout. It’s what good teachers have been trying to do for years. Book is on the Wish List. Meh! Local library doesn’t have this book… Yet. However did request The Talent Code. Thanks for the parenting tips. Thank you. Great post. Plan to get the book. Wow. I need to go right out and get this book. Thanks for the great post, Andy! Your blog continues to help me be a better parent and a better cook. I don’t know how you and Jenny do it, but please keep up the good work! My husband and I will be reading the The Talent Code/The Little Book of Talent. Love the advice on praising children’s efforts. I was fascinated by this distinction in Nurture Shock too. Thanks for this insightful post. Dan is an incredible father, and he and his wife Jenny are raising terrific kids! We are fortunate to have our children in the same school. I highly recommend his earlier book Talent Code. I so wish I had found this book 20 years ago before my kids were grown, what a help it would have been. They turned out great but I think I would have been a better parent, and maybe some of the little bumps wouldn’t have been so…bumpy. Great post thanks for sharing! Love this. It reminds me of a killer book I just read-Mindset. Have you heard about it? Life changing. I know this comment is way late but I just found your blog (via A Cup of Jo) and I’m spending way too much time going through posts. I’m hoping to buy your book soon. Thank for the wonderful posts.